This weekend in the English Premiership ended with Man City sitting pretty at the top of the log. Manchester City’s visit to West Bromwich Albion on Saturday was a chance for the host to put a spanner in the works on the Man City side who in recent weeks have been scoring goals for fun. Outplaying them was not going to be an option, but maybe a sturdy defence and a good break would suffice. After all, they were stopped mid week from scoring for the first time this season in England, in the EFL Carabao Cup. However, Pep Guardiola’s men who took the lead, in the first half during a whirlwind opening 15 minutes and were 2-1 ahead by half- time. It was a nervy finish to the game, as it ended 3-2 and Man City at the top. Defending Champions, Chelsea were on the road too, visiting Bournemouth. It was not an easy, and it took the individual brilliance of Eden Hazard, who scored from the left side of the keeper’s area beating Begovic at his near post. Chelsea with all 3 points. Liverpool were to bounce back from a recent slump in the English Premiership, by defeating Huddersfield Town by 3-0. At the Emirates Stadium, Arsenal went up against Swansea City, who in seasons past proved a difficult side to beat. Things did not begin well for Wenger and his men, as against the run of play, Swansea took the lead, causing a noticeable quietness for the Arsenal faithful. In what was Arsene Wenger’s 800th game in charge, whatever was said during the half-time team talk worked to perfection. 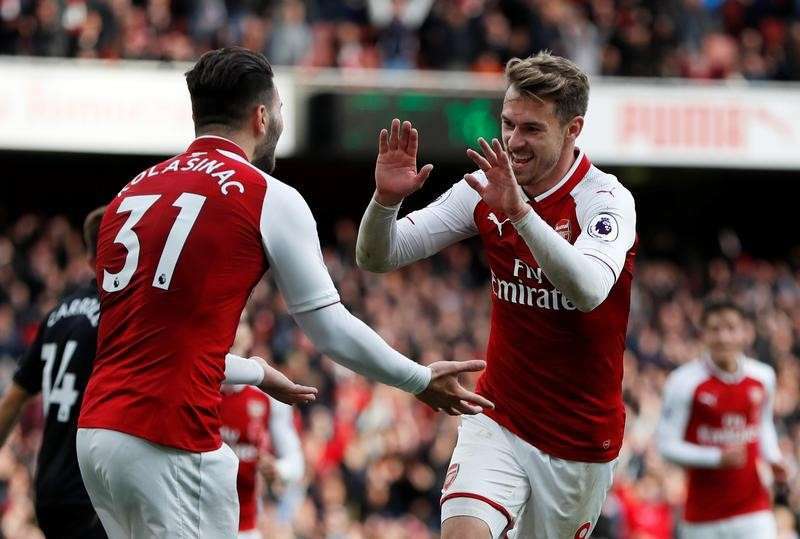 As Arsenal came back on the pitch and within the first 15 minutes of the second half were ahead, with a goal each from Serge Kolasinac and Aaron Ramsey sealing the victory. “Again we have showed the mental strength to come back and win the game,” said Wenger, who enjoyed victory in his 800th Premier League game. At Old Trafford, Manchester United hosted Tottenham, with the game crucial for both managers as they both had to keep the pressure on the leaders Man City.